Written for front-line child care teachers, Meeting the Challenge became a runaway best seller for the National Association for the Education of Young Children (NAEYC) when the prestigious American organization selected it as a Comprehensive Membership Benefit in 1999. The Canadian Child Care Federation (CCCF), the booklet’s original publisher, was so convinced of its worth that it distributed it free to every child care center in Canada. In the U.S., Meeting the Challenge is available from the Education of Young Children (NAEYC). 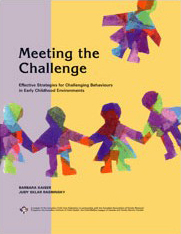 In Canada, Meeting the Challenge is available from the Canadian Child Care Federation (CCCF).